Yesterday I was lucky enough to hear Nicolas Winding Refn talk in detail about his latest film, Drive. The film won Refn the prize for Best Director at Cannes and understandably the film has a lot of hype surrounding it. And it is all entirely justified. Adapted from the book by James Sallis, the director explained how Ryan Gosling approached him with the initial idea, but the process had a very rocky start at a restaurant after the director reacted to medication he was taking for feverish symptoms. Not being able to even string a sentence together, Refn had Gosling drive him home as he was too ill to get a taxi. Still unable to talk, Gosling turned the radio on to unhinge the awkward silence. Things got increasingly worse for the director when he started to cry along to ‘Can’t Fight This Feeling’ by REO Speedwagon. After suddenly breaking his silence and singing along, air drumming, the works, Refn screamed in Ryan Gosling’s face that he has the answer. He knew what Drive was all about. It’s the music. It is exceptionally clear how Refn’s emotional experience has carried over to his work. The soul of the film is the soundtrack, the characters appearing to breathe with it, tracking both the intensity and fragility of Gosling’s emotions perfectly. Adding a euphoric veneer to the simple act of driving through the normally monotonous city streets, the electro beats automatically make us view this film as retro, even when showing us the modern American skyscrapers. From the trailer, you’ll know this film is rather heavy in regards to violence – hammers, guns, fists, you name it – but the film’s strength is that it commits unfailingly. There may not be blood in every scene, but when it comes it is all the more hard-hitting, arriving in short sharp bursts that are hard to predict and more than a little jumpy. The brutality comes from the hands of Gosling’s beautiful monster; silent, stoic and absolutely mesmerising. The incredible ability he has to emote with his eyes says more than any amount of words and was a fantastic choice Gosling and Refn made in regards to how little dialogue the character has throughout the film. Next-door neighbour Irene (Carey Mulligan) is the only person able to make him drop his unyielding outer shell, stripping him down and making way for a very beautiful and fragile relationship between the two. The scenes they share are nothing short of stunning, especially a pivotal part of the film that takes place in a lift and shares a kiss with a boot-driven skull-smashing – as stunningly tender as it is utterly merciless. Where other films would have the girl screaming to the heavens and running for the nearest exit, what plays out here is silence. Gosling’s contorted face and Mulligan’s numbed expression after this incident being just one of many examples that display Refn’s ability to continue a thought process through silence. But the silence in this film does not irritate, it simply draws you further in. Albert Brooks really is the standout of the fantastic supporting cast, a world away from his days on Saturday Night Live, and a complete revelation as the relentless Bernie. Bryan Cranston plays brilliantly alongside the silent Gosling, coaching him at work, arranging his getaway cars at night and providing paternal advice in-between. Oscar Isaac impresses as always, almost unrecognisable as Irene’s husband Standard and Ron Perlman has a nasty and deliciously egotistical character in Nino. 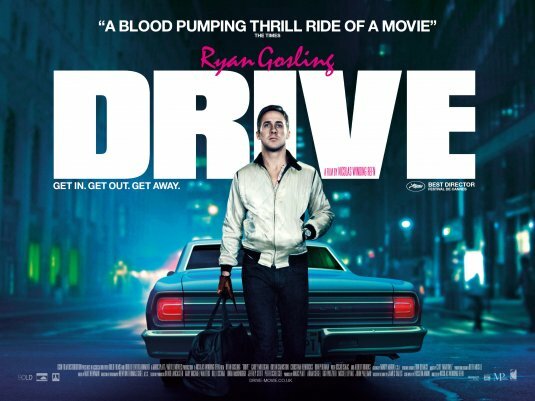 Visually stunning, Drive is magnificently brutal. It is a haunting work that, for all its knives and guns, is never afraid to be still. You are invested from the instant the film begins and you never have a chance to get off the ride – not that you’d want to. An incredibly tense viewing experience, as an audience you feel completely relaxed under Refn’s direction and never feel for a second that he might falter. To contradict the film’s retro tones, Drive really is a modern masterpiece. My favourite films include Fight Club, The Graduate, Back To The Future and The Lord of the Rings, but I’m happy to admit that Indecent Proposal is more than just a guilty pleasure. I also have an unhealthy obsession with Michael Fassbender.